I find I am rather addicted to carving Diamond Willow as of late. I love the way it carves and the way it looks once you do. Plus, after the first snake shillelagh I completed, I went back to my old man’s place and stole all the rough Diamond Willow he had –- which turned out to be one. I needed more. The search was on for more at the local wood shops and across the interwebs. You can find it on eBay or even Amazon for about $20 for a 55” rough blank. I’d even be willing to pay that for the pleasure of working with it again, but I can’t help wondering if there’s something I’m missing. What’s really funny is I don’t prefer the nice, super-straight ones that make perfect canes; I like the ones that look like they’re rejects from a haunted forest of some sort. They just look like they have more character to me and would be better for carving strange things into them. So really what I’m trying to sort out is: What would be a good, cheap place to get some really knurly Diamond Willow rough blanks — any ideas? Let us know in comments. *Thank you to Wupen of Wupen Walking Sticks in Vancouver, B.C., for use of the great photo of his handcrafted Diamond Willow walking sticks! Sean – search out the local buck skinner/pre-1840 re-enacters in your area. They usually are a good source for this stuff. At least they are up here! Make friends with someone in Alaska. There are groves of the damn stuff all over the place. Offer to trade them something common in your neck but hard to get up there. I’d offer to be that friend but I am out of state for school. Grwat prices nice variety, good source. lololol, Dear Sean – move to Alaska (the Interior, Fairbanks) and you will find yourself overrun with tons of it just like me. I also am addicted to the soul-cleansing transformation that hard work and weeks (one for years), of sanding accomplishes. Really, truly, diamond willow is pretty rare in the lower 48, however, if you want your ordinary walking sticks as you show above, just hand in the out-skirts of Fbks. I obtain mine mostly in the surrounding hills (those that surround and create the Tanana Valley in which we live). If you really want to get gnarly and infamous pieces, you must either hike (don’t do it) or boat during hunting season to the old Minto Flats. It is primarly unhabitated, full of moose, damn hard to travel or hunt in and absolutely FILLED with diamond willow easily the circumference of a man’s waist (no, I do not mean those ugly burls found on spruce trees). Bring your chain saw and river boat (and rifle) and be prepared to kneel before Alaska’s beauty in all its forms. There were so many HUGE pieces of diamond willow that my husband only brought me back 2 (the boat would not accommodate more). One of them I transformed into a table in my home. Not out of burl, remember, but the sheer circumference of the piece itself, with almost two foot long diamonds on it. Took all summer working all day every day sanding and using non-powered wood tools to “sort of” complete it. I couldn’t stand to do any more and completed it. (by that I mean end up with 600+ or greater grit, clean carefully and then clear varnish, between sandings, over and over again. Wish I had the guts to sell it but I put too much damn work into it. do you have a picture of your table? I GOT IT!! !many knarly, fresh rough cut, Rare Red, southern MN, Diamond Willow, from 20 to 200inch pieces..contact my email if interested, thanks, josh. I am also looking for a source of diamond willow. I would rather go out and find my own but somehow age and loss of cartilage in my knees are preventing me from doing so. But I would try if I had someone to go with. What do you have that you are willing to let go of? I live in Rapid City, SD.I could even come pick some up if you have it. OR can you direct me to an area where I might easily find the diamond willow or perhaps some porcupine chews??? Let me know if you would please. Thanks and Happy New Year!! I have carved sticks from all around the country. I like the look of the diamond willow. I would like to pruchase or trade for a couple peices. Do you have any or know where to get. Do you still have any avaiable? A follow up on wupen, I started working diamond walking sticks a while ago I carve wood spirits,bears, wolves, etc. I wanted to find a place to buy more sticks ,I had the great pleasure of talking to Wupen, He took the time to talk to a novice in this, we spoke for almost a half hour. I cant speak more highly of anyone, He is the nicest guy. Josh,give me a call. I am interested in some diamond willow of all sizes. My phone # is 989-205-1964. Call anytime. Always up till after midnight michigan time. Thanks! i can suppluy you with all you want my# is 1-705-465-3442 and i live in canada and can give you very good deals. When I went out willow hunting I was picky on what I cut. I would cut one’s that had twists and turns within the diamonds as well as normal ones. I made many canes as well as walking sticks. If someone caught thier eye on what I had and I felt it was going to a good owner I gave it to them. I can no longer go out and find willow like I use to. Also I am in the need of a cane. It’s now my turn to see if anyone has a spare stick that has what I hunted for and is willing to let it go for a small fee. like to find out about some diamond willow for walking stcks…. 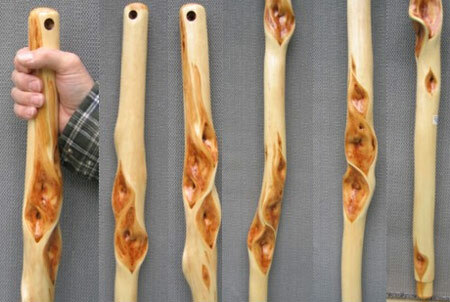 I am a disabled vet and have made a few walking sticks for myself and friends. Have never made any from Diamond Willow but have seen some great looking raw pieces on eBay but can’t afford the prices and shipping. I live in Maine anyone have any ideas who I can get some at a reasonable price? Guess I’m lucky, I just cut down a few diamond willows when I go back to my uncle’s place in N. MN every year. I’m going to try to make a mailbox before winter. It grows south as far as central Wisconsin at least. It’s best to look in a thicket so it has the diamonds, the ones in the open have branches that are too healthy to form good diamonds. Rough peel the live bark while it’s still green, a lot easier than after it dries up. I also have diamond willow by the droves. Let me know if you’re interested. I could send pics of what I have. My email address is tracyray46@gmail.com. hi Grant please send me some pics of diamond willow. where in Alberta are you? could you email me pictures of diamond willow? are you in the Edmonton area? I use to live there. Down by the river,I live in Billings, Mt. I would be happy to show you hpw to find it, srnd me an email. Just read your message about the diamond willow. My friend and I are looking a bunch of sticks, we live in Colorado and are going to plan our vacation to an area where we can get some. Do you think you could help us? We have diamond willows in all lengths & diameters – from wand to trunk sized. I found a DW that is 14 ft.long and 21″ in circ at the base. The pic can be seen at Canadian Woodworking Forum. Just type in Diamond Willow as a search there. Do you buy diamond willow sticks? I will be in Anchorage and Fairbanks in early May and want to get some raw diamond willow. Please email me if your still interested in purchasing and that way I could email pics. Interested in purchasing willow sticks. Please contact me. Thank you. I would like more information regarding your diamond willow sticks. I have at least 100+ diamond willow ‘former f nice posts’ that I have harvested from my pasture. These have been outdoors through the elements for nearly 50 years, if not longer. Contact me if you’re interested in purchasing some. Thanks. Where can I find diamond willow in willow alaska? How much diamond willow do you want and what do you think its worth?